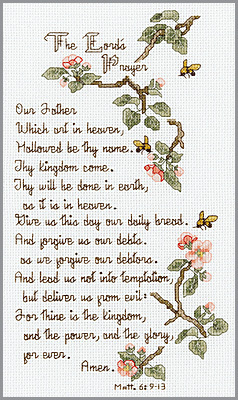 This 5.5" x 10" Janlynn counted cross stitch kit beautifully displays The Lord's Prayer surrouned by apple blossoms and buzzing bees. The kit contains 14-count cotton Aida fabric, 6-strand corded 100% cotton floss, needle, graph, and instructions. Made in the USA.